The book is written by Ben Simonds, which is known in the Blender Community for some years now producing art and tutorials and is now co-heading his own Animation Studio Gecko Animation Ltd, which has already produced some impressive works. Over time Ben released various tutorials on his site, which I always found to be of good quality and value. Now it seems he has made the next step and pouring all this knowledge into the making of a book. Blender Master Class (BMC for short) comes as a paper edition with a DVD included as well as an ebook. The paper edition is 260 pages, with images and illustration in full color. BMC is not a complete Blender Guide nor is it targeted at blender alone (as it also goes into texturing with the Gimp). It highlights the workflow techniques and production steps typically needed in creating still images or assets. 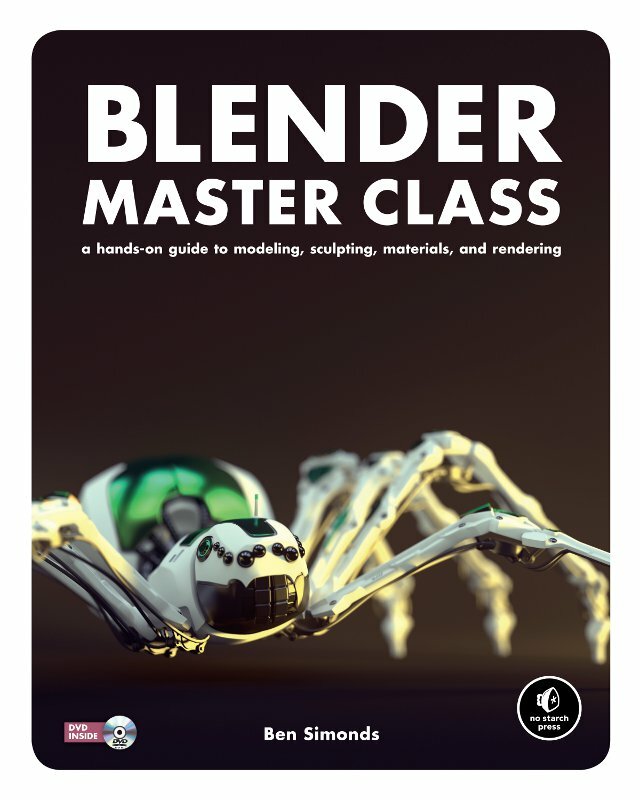 And as the title implies, it is not a beginner book and you should be a least be a bit familiar with blender and/or CG. The main topics covered are modelling, sculpting, retopology, UV unwrapping, texturing, shading, lighting and rendering. This list, while still by far not covering all aspects of blender, still covers an immense and diverse area. The approach Ben Simonds uses, takes this into account. As he progresses through the workflow and production techniques, he uses 3 different real projects to demonstrate and highlight different aspects of the same base topic. There is the bat creature for organic model creation, the spider bot which targets the hard surface aspects and challenges and the temple ruins, covering the environmental aspects. Most books on blender start with a short introduction into blender itself and this book is no exception here. But for my taste this introduction does not really add value. As said before this book is not for the beginner and more advanced users (even intermediate ones) already know what is presented here. The same is true for the introduction to the gimp. What I found very good and important was the chapter about preparation, planning and the use of references. Ben first presents us with the basic concepts and workflows and then illustrates their practical implementation in blender and/or gimp. With the constant use and reference to the 3 projects this approach avoids the dry grey theory syndrome. There is also quite some space dedicated to some basic rules of composition. While I find this aspect very important, I am not quite sure if it really fits into the context of this book. The modelling part covers the important role of topology and its use in blender. The 3 projects offer plenty demonstration for blender’s various modelling tools, which Ben Simonds presents in a very clear and understandable way. And again it is a healthy mixture of basic principles and practical hands on. From observing Ben’s work over the last years, it was apparent that he takes a liking in sculpting, and so I was very interested in how he will present this topic in his own book. Adhering to his approach he gives a very good introduction to sculpting in blender. He highlights all the important techniques and workflows. The main project used here is of course the bat creature but the sculpting approaches used in the spider bot for hard surfaces expands the view on sculpting possibilities in a very informative way. The only ‘gripe’ I have is that with blender 2.66 and the inclusion of dynamic topology sculpting and matcap 3D viewport, quite a bit of the presented workflow may not be the best for the new tools at hand. That’s not a fault of the author of course, it is just unfortunate timing. Retopology and UV Unwrapping again gives you the basics of what you have to know about this topic. It is not overly expansive but presents the necessary information in a good and concise way. Then there is the chapter about hair and particle systems. While an interesting topic I found it oddly out of place for this book. It is a crash course through a lot of features blender has to offer in this regard and yet it only gives a small glimpse into this vast area. With this it is different to the other topics covered so far and therefore created the odd impression for me. Texture baking and especially texturing is covered very thoroughly and it shows again the love Ben has for this topic. The texturing part is heavily focused on the gimp, which is no real surprise giving the texturing possibilities blender has (currently) to offer. Ben makes very good use of the tools at hand (be it blender or gimp) and presents them in a very understandable way. He even tries to establish a non destructive workflow where possible, which in my eyes is an essential part in an effective texturing workflow. The Material chapter deals with the shading aspect and with this faces the dilemma of having 2 native render engines inside blender: internal and cycles. Ben Simonds does quite a good job explaining the two and their respective shader setups. Blender Internal is used for the bat creature, since it makes use of SSS and strand rendering, which is not available in the blender version used in this book. The explanation and presentation for the bat creature is again very good and teaches you a lot of important background information and little tricks to be able to tame the internal render engine to your liking. The cycles engine is then used for the spider bot. This part is not as expansive but that is partly due to the simpler (shading) of the bot and also that cycles does not need that amount of tweaking. Interestingly in Lighting the typical approach used so far is reversed. Ben starts out with the specifics of blender’s render engines and then moves on to the general principles of lighting. Coming directly from the material chapter this might make sense but for my taste this could be reversed. This chapter delivers good basics for lighting and how to use blenders light types and tools to arrive at the best lighting for a scene. Rendering and Compositing highlights the basics. Again it has to cover both render engines and their peculiarities. Especially compositing is a vast topic and the book just gives a very basic view on this topic, mainly to introduce the tools blender has to offer, demonstrated by simple workflows. What I found good about this chapter was that Ben shows that an image is not finished once it comes out of the renderer but you still can ( and should) retouch it in additional steps in the workflow (gimp in this case). The book closes with some ideas on how to improve the overall impression of the used projects and even touches the aspects of rigging and animation which I personally found not really necessary. Blender Master Class is a very fine book and it is delivered in a way that the knowledge it tries to convey is not a short lived one. You get the ideas, motivation and theory behind the workflows in combination with their actual implementation in a workflow using blender and gimp. With this you are much better equipped at exploring new or changed software features or even deriving your own workflows. There are a lot of books out there acting as recipe collections, where you are just presented with how to do a specific thing using a software. BMC is definitely not one of them. BMC is not an expert book, trying to teach you the latest and last tricks of the various areas of cg creation, but it lays the foundation to master the general workflow and understand the principles behind it. And it does this by using blender and gimp with a wealth of good advice and thorough and concise practical explanations. Thus the title is an adequate one, as it teaches you how to master these aspects using blender (and gimp). A nice side effect is, that you can purchase the book via the blender store and by doing so supporting blender. I do not rate by stars, ribbons or even suzannes, but Ben Simonds has delivered a sound piece of teaching which should have a place in the aspiring 3D artist’s library. I can wholeheartedly recommend this book.